Posted August 7, 2012, in We R Arts and Sciences Student Spotlight. We’re excited to share an update with you about Ms. Peña! The second convention of the Black German Cultural Society, NJ was a huge success. You can view pictures of the event on https://www.blackgermans.us/convention2012/ or on Flickr. Watch Ms. Peña give introductory remarks before presenting the convention’s keynote speaker, Yara-Colette Lemke Muniz de Faria. Arrangements for the third convention have already begun, and it is scheduled for the second week of August at Amherst College in Massachusetts. Additionally, Ms. Peña has received a stipend to study at the Goethe Institute in Germany. Congratulations on all these great accomplishments, Ms. Peña! Growing up in Willingboro in the 1960s, I had my doubts about my parentage, though I never had any evidence of an adoption until much later in my life, in 1994. At that time I learned that I was a native of Germany; my biological mother was a Danish-German concentration camp survivor and my biological father was black, and most likely a soldier. I was adopted by an African American military couple and brought to the United States. This knowledge made me eager to learn more, and as I searched online I discovered others who shared a similar history. I became involved in the Black German Cultural Society of New Jersey, and am now the president of this organization. The mission of this group is to connect Afro Germans internationally and to share their experiences. Last year we held our first convention in Washington, D.C., and our second convention will take place in early August in New York City. Upon returning to the States from a brief visit to Germany to attend an annual retreat for Afro Germans, I decided that it was necessary for me return to school. It was imperative that I learn the German language in order to accomplish the goals of the Black German Cultural Society of NJ. I met with Dr. James Rushing, Associate Professor of German, and Dr. Christine Cosentino-Dougherty, Professor II of German, and was delighted to discover that as an alumna of Rutgers-Camden (I earned my first bachelor’s degree in psychology in 1983), re-enrollment was not a complicated matter. Within a few weeks, I was attending my first German class. I could have never imagined the level of support that I would receive from my professors, nor the future opportunities that would become available to me as a result of their encouragement. I felt that they were personally invested in my academic success and ultimately, my desire to become a research scholar. The following semester, at their urging, I applied and received scholarship support to attend the Rutgers-Duke Study Abroad in Berlin Program. This proved to be an invaluable and foundational experience. Now, as a master’s degree student in the Department of Childhood Studies, I am privileged to be a part of an internationally respected, pioneering research program. I am interested in the historic childhood of Afro Germans, transnational adoption, and youth identity development. Both my personal history and the classes I have taken as part of my degree program have helped to more clearly define my research objectives and goals. Last year, I presented my research on Afrogerman Youth Identity, developed during my coursework, at the Graduate Forum on Race and Ethnicity at Rutgers-New Brunswick. I also received support from a Dean’s Graduate Student Conference Travel Grant for my presentation at the College Language Association Convention, held at Spelman College in Atlanta, Georgia. I’ve been invited to be a plenary speaker at the 10th International Conference of the Collegium for African American Research (CAAR) at Agnes Scott College in Georgia in March 2013. When I complete my current program of studies, I will have achieved three academic degrees from Rutgers-Camden. As a non-traditional student, and a nearly lifelong resident of South Jersey, I especially appreciate having been able to obtain such a high quality education so conveniently close to home. Ms. Peña is a member of Delta Phi Alpha, the National German Honor Society, and serves as president of the Black German Cultural Society, NJ. In May 2009, she received the Petros Odabashian Award, which is presented to the student who shows the most promise in the German language and literature at Rutgers-Camden. 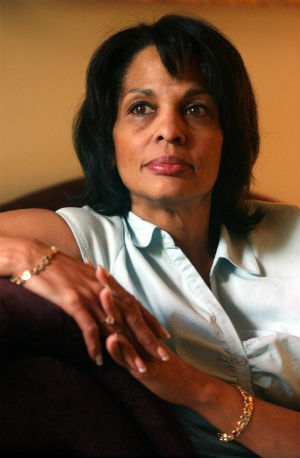 To learn more about Ms. Peña, read “Discovering the life of Afro-Germans,” which appeared in The Philadelphia Inquirer on June 6th, 2012: http://articles.philly.com/2012-06-06/news/32056706_1_blacks-mother-history. This page was printed from http://fas.camden.rutgers.edu/2012/08/07/rosemarie-pena/ at 1:34 AM Monday, April 22, 2019.